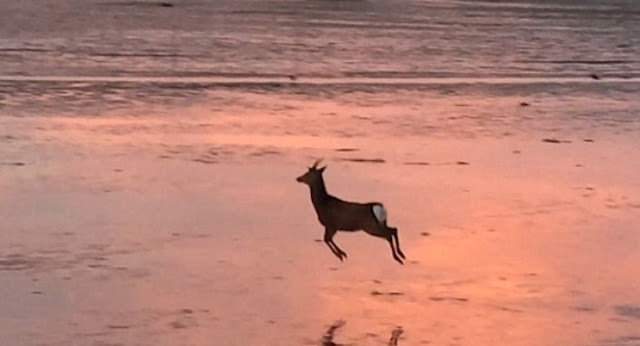 This is the heart-warming moment an escaped deer celebrated its new-found freedom by literally bounding along a shoreline. The joyful animal was spotted with a spring in its step by Dave Mott while he was out walking his dog in Poole Harbour in Dorset. The Sika deer is thought to live with the resident herd on the Brownsea Island nature reserve but had managed to swim the half-a-mile stretch across the shallow harbour to the mainland. Mr Mott, 48, from Poole, said: 'I was walking my dog, Lana, and I looked out at the harbour because I noticed the tide looked particularly low. I don't think I've seen it that low all year. 'At that moment I spotted something moving in the distance. At first I thought it was a dog but it was too big and as it got closer I realised it was a deer. 'I assumed it had swum over from Brownsea Island. The tide was really low so there was probably only about a hundred-metre stretch it had to swim. It's only about half a mile away. 'I tried to take a video but it was too far away so I just stood and watched it for a while and it just kept coming closer. 'Then when it went across in front of me I just took a video. As soon as I got it I thought 'this is a special bit of footage'. 'It was quite bizarre watching it bound past like that. It certainly looked very happy. 'There was only me and one other dog walker who saw it, so it was quite a special moment. 'I've been walking my dog there for 16 years and I have never seen anything like it. Responses to "Escaped Sika Deer Is Filmed Enjoying Its New Found Freedom"